Home Cedar Point Steel Vengeance Update! Track-work complete! Steel Vengeance Update! Track-work complete! 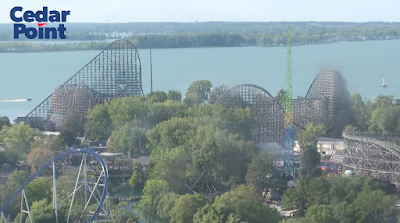 Cedar Point has been quick at work to complete the drop for Steel Vengeance! See the last piece being put into place here!! What a great few pics, so when will we see testing begin? Brake systems and lift systems are still needed, and I wouldn't be surprised to see testing begin in the Spring, just before opening. Steel Vengeance is slated to open in 2018, the coaster, in the Wild West-themed area of the park, is 205 feet tall with a 90-degree drop. Steel Vengeance has 4 inversions, more airtime than any other coaster in the world, and lots of headchoppers during its second half! This could very well be the most anticipated coaster ever built.